The perfect glue stick for precise application. Pen style makes applying easy while the narrow glue marker makes it precise. Blue airsoluble ink shows where glue has been applied. Color fades as glue dries. Any remaining glue washes out. 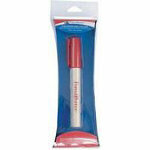 Glue refill item FP7776.